Create a design incorporating the diamonds into one ring that can be worn daily, making the center diamond low, but with some detail to make it stand out, as it was the clientâ€™s original diamond. - Using 6 large diamonds from the oldest cluster ring, we created a channel using three diamonds on each side of the center diamond. The sides are slightly raised to allow light into these stones as well as keeping the profile of the center low, per the clientâ€™s request. 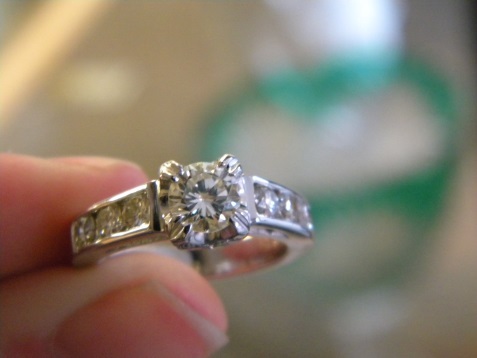 -The center diamond is set in a low, custom designed head with a very special touch. On each side of the center diamond, at the base, are set four small diamonds in the curve of the head. 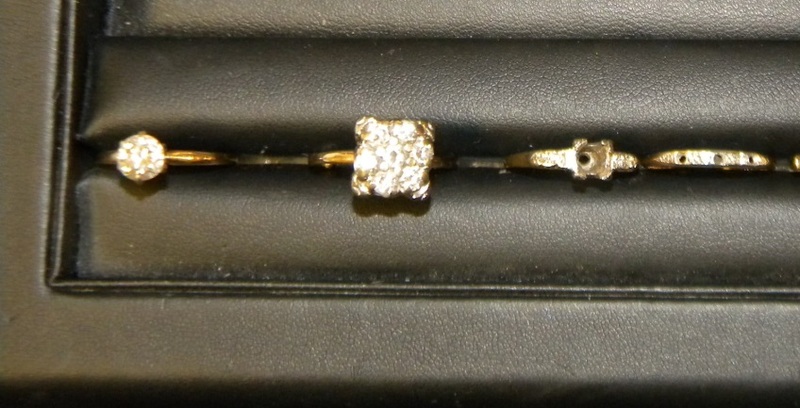 These 8 small diamonds were from the clientâ€™s motherâ€™s engagement ring and wedding band. The marriage of all these diamonds brings generations together in one ring to be worn and enjoyed presently and perhaps passed down to future generations.